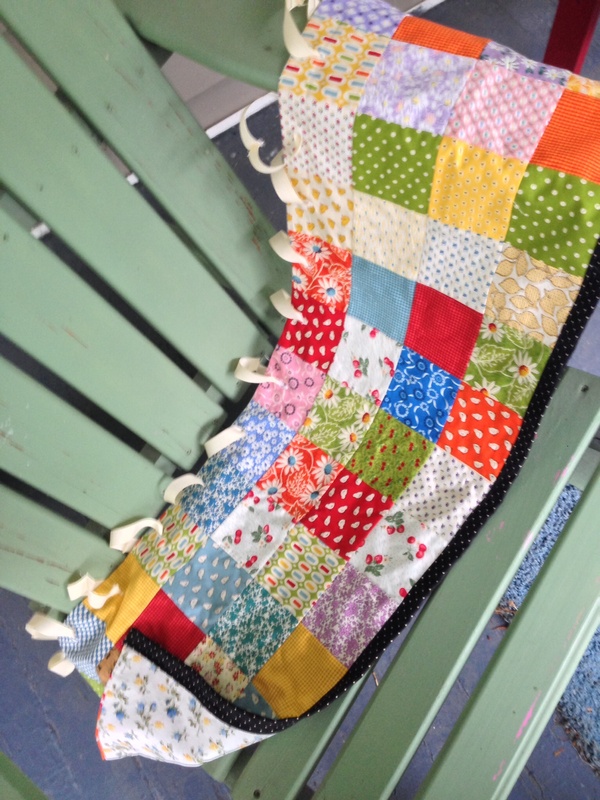 Patchwork Kitchen Curtains – Vintage-y Goodness! I live in an old house. Old houses can be great if you love character. I do love character. Old houses can be not so great if you aren’t able to spend a lot of money on repairs. I don’t have a lot of money to spend on repairs. DH has made some great progress on fixing up this old wreck we call home. Organizing or completing several plumbing and electrical projects that have made the house a lot more liveable. One of the last few essential projects is fixing a portion of our kitchen ceiling. We have opted to fix this ourselves, and DH has been a champ. Being an old house, nothing is easy. But I am close to having a kitchen without a section of ceiling that I had to conceal with doo-da crap on top of our cabinets. I don’t have a budget to redecorate, and not sure I would want to. I love the collected cottage-y eclectic look of our kitchen. But I now can do some editing now that the bones of the kitchen will be better. So I decided to make some new curtains. And I love love love love love love love. DH hung them for me as a surprise for me when I got home from work. Like most of my house, the kitchen is a cacophony of color, so I used a cacophony of color in the curtains. 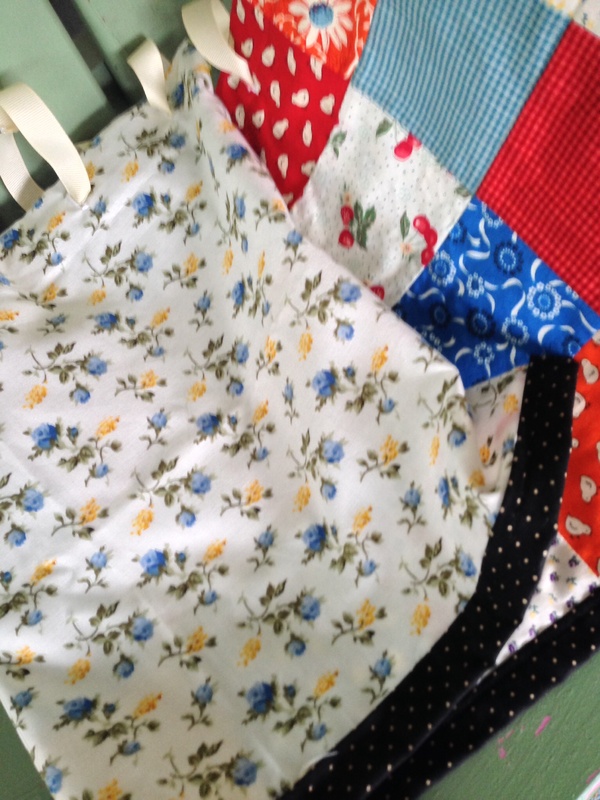 I got a charm pack (Everything But the Kitchen Sink – hahaha) and layer cake (American Jane) from the reproduction Missouri Star Quilt Co store. (I am *so* lucky to have this quilting store empire only an hourish away from my house.) 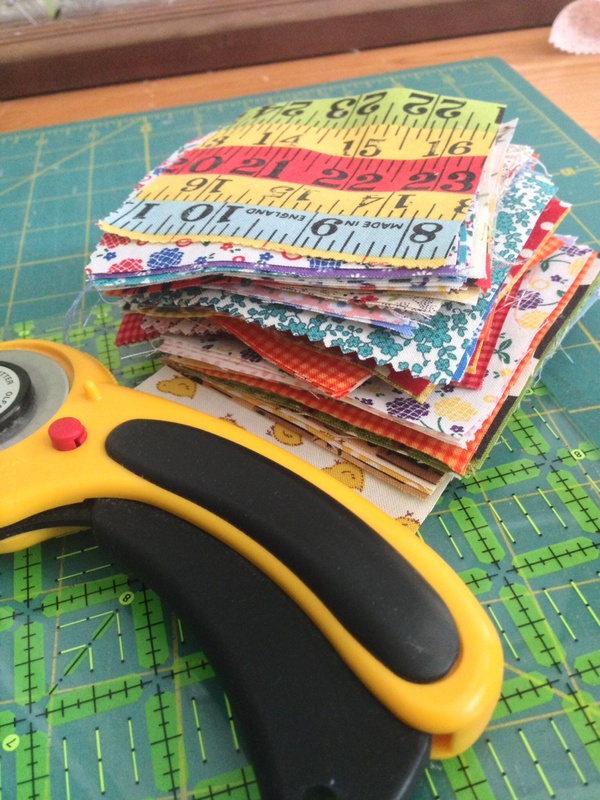 I combined these with a few scraps and stash that I had. I love all of the prints in these curtains – very, very happy-making. I had lots and lots of this little rose fabric – more English country cottage than 30s reproduction fabric, but I think it plays well. I bound the bottom with this adorable Moda Essential Dots – which I think gives the curtains some visual and actual heft. I couldn’t find the types of rings I wanted, so I sewed ribbon loops into the buttonholes at the top. (Me and my buttonhole foot now are BFFs). 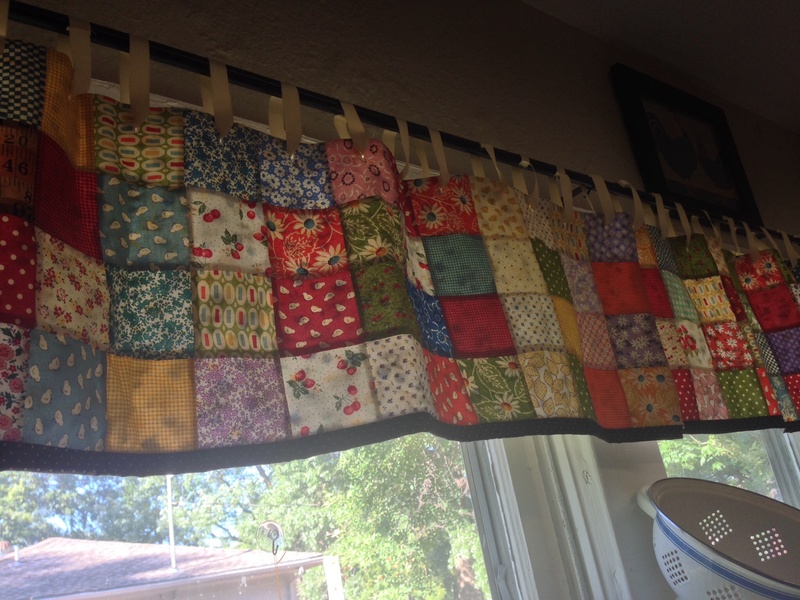 I used the valances that my mom helped me make for my stepdaughter’s room as inspiration. I am very, very proud of myself for figuring out the right size and how to construct these. It is slow, but I can see my skills improving. If I had it to do all over again, I would make sure I could find the rings I wanted before I made the buttonholes, and I would have used a heavier interfacing on the patchwork fronts (you will be able to see daylight through these valances), but overall I am very happy.